"Hillary Clinton and some loon from the Republican Party are supposed to go head-to-head in 2016 for the presidency. Bernie Sanders is interfering with the version of American democracy the corporate media approves of, namely the kind that is dependent on rich donors and purchased politicians," explained Roger Ailes, Fox "News" puppet master and expert deployer of smoke and mirrors. Bernie Sanders speaking at an event in Phoenix, Arizona in 2015. Ailes added, "And Fox News is not alone in being upset and shocked by Bernie Sanders' appeal to Americans. NBC and CNN portray America as being far more conservative than it actually is, too. It's just that Fox is an expert at deception and keeps calling them 'liberal' so uninformed Americans who think they know stuff move further to the right." "Political discourse has been so poisoned by the right-wing corporate media's games there are Americans out there who actually believe Fox News is too liberal. 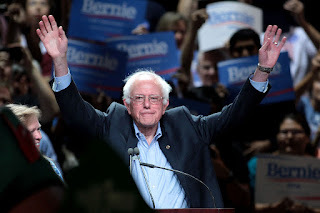 While I am proud of this, it is very disconcerting Bernie Sanders' unapproved progressive message is getting through to Americans despite the media ignoring him," lamented Ailes. A statement released by NBC also expressed its shock and anger at Bernie Sanders' increasing support despite it employing "light-weights and non-journalist hacks like Chuck Todd, who couldn't do a hard-hitting interview to save his life." CNN pointed to Don Lemon - who was named one of America's worst journalists in 2014 - as evidence of its pro-conservative and truth-bending credentials, but admitted everyone on Fox News was giving it "major competition" in 2015. The campaign of Bernie Sanders released a statement urging the corporate media to "get over it," and promised Americans he would continue to run a clean, small-donor funded presidential campaign.